Maker Ed’s Resource Library contains informational content, intended to help educators and facilitators from all backgrounds and environments get started — and continue — making in education. The following guidelines and questions, along with insights and feedback from the educator advisory group, were used to create, then to evaluate and determine which resources would be posted to the Resource Library. Maker Ed retains the right to edit its guidelines at any time. 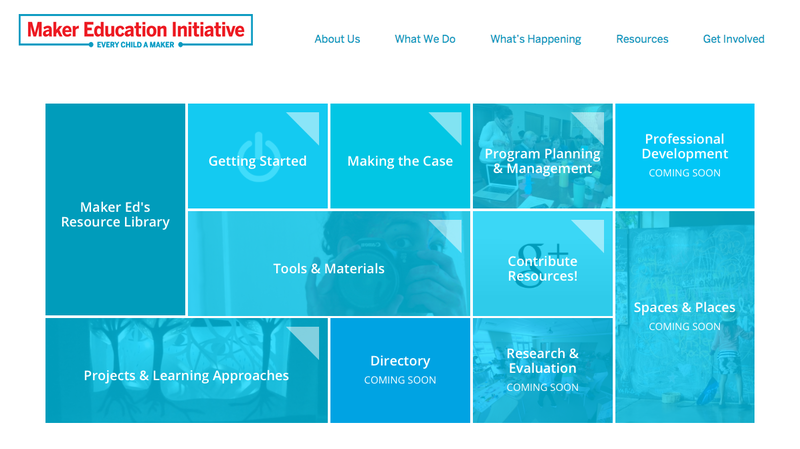 This Resource Library is an ever-changing, evolving collection, and Maker Ed is excited to regularly review incoming resource submissions from the greater community of educators and makers. Maker Ed encourages educators and makers to submit and contribute your favorite resources! The Resource Library is made possible by the generous support of Intel. To support this work — and the work of our communities, please visit the Donate page. Primarily informational, not promotional, in nature. Easily accessible, simple to navigate, and free of charge. Concrete, with clear takeaways and ways to immediately implement, if desired. Useable by any educator with limited time and resources. Clear, with enough context and background to be relevant and understandable. Unique, providing information that others do not, or in a more accessible manner. Connected to a specific resource, if applicable, not just a general blog. Useful for any or all subsets of maker educators, whether classroom teachers, afterschool coordinators, librarians, museum educators, administrators, funders, parents, and the like. Appropriate for general audiences and void of strong political agendas or profanity. Disclaimer: Maker Ed’s online Resource Library contains links to third-party organizations, companies, and commercial products. By including these resources, Maker Ed intends to highlight their potential value to the maker education community, rather than to provide an endorsement. The library is independently managed by Maker Ed staff, who adhere to a set of guidelines to ensure that all third-party resources are primarily informational, rather than promotional, in nature.